You are going to Watch RWBY Volume 3 Episode 7 online free episodes with HQ / high quality. Stream cartoons RWBY Volume 3 Episode 7 Online In the past, Cinder recruits Emerald and Mercury after being impressed with their abilities. Later, the three of them offer to make a deal with White Fang leader, Adam Taurus, but he refuses. Some time afterwards, Cinder, Emerald, and Mercury ambush and attack Amber, the Fall Maiden. Initially, Amber overwhelms them with her powers and fighting prowess, but Cinder manages to get the better of her. After defeating Amber, Cinder begins extracting her powers, but Qrow arrives, forcing the three to retreat. Afterwards, Cinder returns to Adam with Dust and Lien, shows off her new powers to him, and offers him a new deal. In the present day, medics rush Mercury out of Amity Colloseum after getting his leg broken. 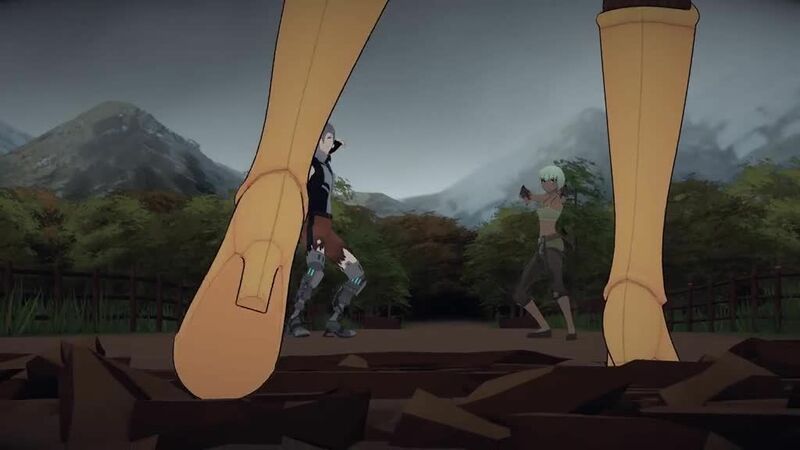 Cinder then takes her henchmen back to their hideout, where it was revealed that they intended to frame Yang using Emerald’s illusion Semblance and Mercury’s prosthetic legs to their advantage. Cinder and Emerald then tell Mercury to lay low as they go off to watch the next match.